Freezing temperatures are continuing to affect the Kansas City metro with schools closed and accidents on the roads. KANSAS CITY, Mo. — Freezing temperatures are continuing to affect the Kansas City metro with schools closed and accidents on the roads. Many school districts canceled classes for Thursday, after dismissing early Wednesday. 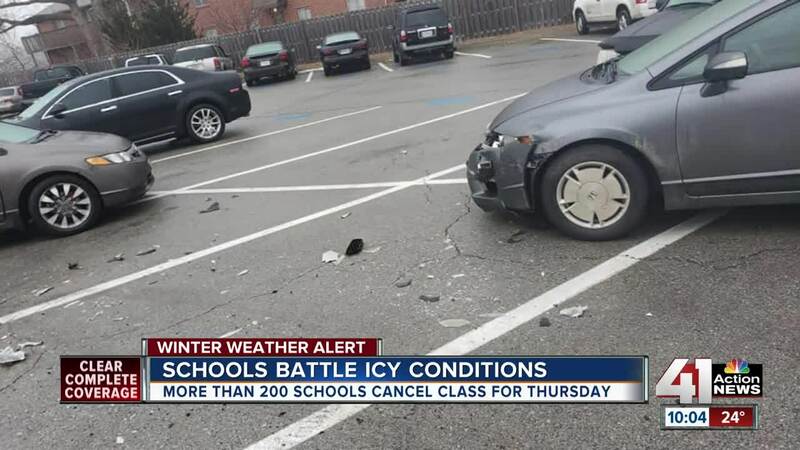 In Independence, the student parking lot outside of Truman High School turned into a sheet of ice Wednesday morning, according to students and parents. "I was telling them all to slide their feet. We were all falling," said Aimee Blankinship, who went to the high school after her son's car had trouble getting up a hill. According to police there were two minor accidents. A student who, police say, was driving too fast hit three parked cars. A salt truck also hit a parked car. Truman High School was not alone-- other schools faced challenges with icy pavements. Shawnee Mission South's principle slipped when he got out of his truck. He later tweeted out a video, writing, "As you can see, I unsuccessfully tested the ice melt in the parking lot and I can confirm: IT'S SLICK OUT THERE!"